Was Islam the inspiration for Iconoclasm? In his negotiations with the enemy commanders, Leo wouldn’t have needed a translator. Arabic was most likely his first language, which is one of the reasons why Islam is suspected as being an influence on him (even though it merely proves that not every native Arabic speaker was a Muslim). It’s tempting to think that the Islamic stricture against images was the inspiration for iconoclasm, but it more likely a development of Monophysitism- the Christian heresy that rejected Christ’s humanity in favor of his divinity. If Christ was purely divine then depicting him as a man was a form of heresy. Monophysitism had deep roots in Syria, and Leo wouldn’t have been the first emperor to pay lip service to Orthodoxy while harboring private Monophysitic beliefs. Added to this natural dislike of icons was probably a bit of pique. When the Saracen army and navy showed up to besiege Constantinople Leo had been preparing for five months. It was he who had bolstered the city’s morale, intrigued with the Arab commanders outside the walls to keep them divided, incited most of the galley slaves of the relieving Muslim armada to revolt, and finally convinced the Bulgarian army to march down to Constantinople and deliver the coup de grace. And yet credit for Constantinople’s deliverance was popularly given to the icon of Mary that had made daily circuits of the city’s walls and was believed to have the city under its protection. 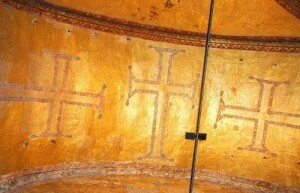 Leo gave a sermon thundering against Icons in the Hagia Sophia a few weeks later. When that produced no great outcry he issued his famous decree. Was Leo III’s reign good or bad for Byzantium? Jack asks if Leo III was beneficial or detrimental to the Byzantine Empire. If you ask five historians this question you may very well get five different answers- Leo is a complicated figure. I’ve changed my mind about him several times, but have gradually come to feel that he was a beneficial ruler. Here’s why. Leo was born in Syria (but grew up on the Black Sea Coast of Bulgaria) and cut his teeth on the eastern frontier. This gave him a knowledge of the Arab mind that stood him in good stead when he became emperor. When he arrived in Constantinople in 717 Byzantium was in a terrible predicament. 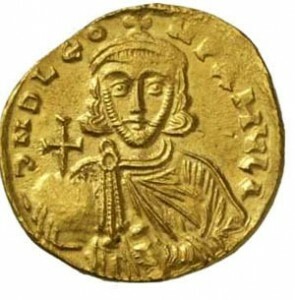 Heraclius’ dynasty had petered out with the bloody Justinian II, the Arabs were already on their way with a massive fleet and land army to exterminate the empire, and the current occupant of the throne (Theodosius III) was an overwhelmed tax collector who had been crowned against his will. (When Leo arrived, Theodosius was more than happy abdicate and become the bishop of Ephesus) A month after Leo’s coronation a gigantic Muslim army was pounding at the gates. Things looked bleak but Leo somehow kept up morale and outmaneuvered the Arabs at every turn. Within months they were suffering from inadequate sanitation and freezing temperatures. After they were appropriately demoralized Leo sent in the fireships against the enemy navy and- in what is surely one of the most brilliant unsung victories in history- managed to bamboozle the Bulgarians into attacking the Arab army for him. Less than half of the Muslim infantry made it home and the grand fleet lost all but 5 ships. Had there been a less capable man on the throne (Theodosius III for instance), Constantinople probably would have fallen in the eighth century and Islam would have had a free run at an undeveloped and divided Europe. That’s the part of the legacy that most can agree is positive. Offsetting that is Iconoclasm. In 726 Leo came to the conclusion that the Byzantine love of icons had strayed into idolatry and he ordered the city’s most prominent icon to be torn down. That unleashed two centuries or so of controversy that was among the most destructive in the empire’s history. So why conclude that his reign was on balance beneficial? Because I think it’s unfair to blame Leo for everything that came after him. And by the true iconoclast’s standards, it’s doubtful that he was really even one of them. The use of icons had gone overboard- they stood in for godparents at baptisms and most people agreed that it could stand to be ratcheted down a notch or two. There was also a popular belief that Arab victories in Asia (and the terrible earthquake of 726) were due to divine displeasure over idolatry. Leo gave a sermon in the Hagia Sophia to that effect and it was greeted with rousing applause. I don’t think he ever intended to say that icons were inherently bad- he promulgated a revision to the law code in 726 that didn’t even mention them- and contemporary Muslim and Armenian sources don’t number him among the iconoclasts. His most controversial action was to rip down the famous icon above the imperial palace, but this can be explained in two ways. First, just before the Arab army had been routed the Patriarch had processed around the city walls bearing an icon of Mary and the subsequent victory was credited to divine intervention. Leo’s own efforts were downplayed and it’s quite possible that he was a tad peeved. Secondly (and more importantly), he replaced the icon with a simple cross and the inscription “I drive out the enemies and kill the barbarians.” I think this was an attempt to resurrect the cross as a victorious symbol. Leo’s main argument was always that the Arabs were winning because the Byzantines had abandoned their true faith. What better way to get back to basics than by fighting under the same symbol that had led Constantine and Heraclius to such incredible victories? This was not so much a strike against the idea of icons as it was a re-branding. There is no evidence to suggest he ever persecuted those who disagreed with him on the issue, and in fact he (ironically) tried to promote religious unity his entire reign. He was always a moderate and for most of his reign he had popular opinion on his side- hardly the divisive figure later writers tried to make him. His son Constantine V, on the other hand, took the whole thing to an extreme. He really did have a theological axe to grind against icons and suppressed them with a single-minded fervor that crossed into obsession.